Tomorrow, Cole’s in Downtown Los Angeles is hosting a Mad Tea Party for International Women’s Day from 1PM to 7 PM. Hollis Bulleit (Bulleit Bourbon) and Kat Wit (Dominick’s) will host the party as part of LUPEC LA (Ladies United for the Preservation of Endangered Cocktails). There will be food and drink specials from Cole’s as well as guest bartenders Jaymee Mandeville (formerly Drago Centro and now with Barcadi) and Karen Grill (formerly Playa and now with Bestia) mixing it up. 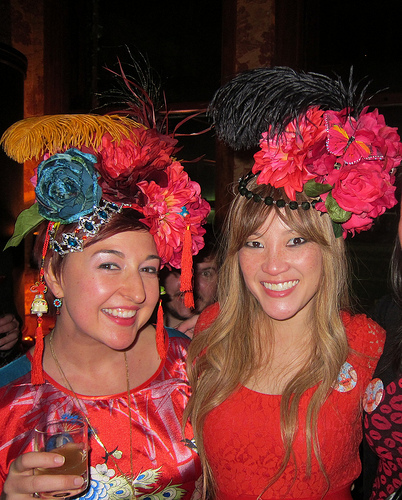 Ladies are encouraged to wear hats, tea dresses and gloves for the Mad Tea Party theme. Cole’s will be introducing the new Happy Hour sliders and tots. Plus Ms. Hollis mentioned Bulleit Rye Champagne Punch and possibly Friday Bloody Marys and beer from Lost Coast Brewery (an all-female brewery). This entry was posted in alcohol education, alcohol tasting, bar stories, bars, bartenders, beer, cocktails, events, happy hour, history, hot bartenders, la, la cocktails, los angeles, spirits, the minty and tagged brent falco, bulleit bourbon, bulleit rye, cari hah, cole's french dip, cole's red car bar, dewars, dress up, events, happy hour, hollis bulleit, jaymee mandeville, jello shots, karen grill, kat wit, la cocktails, los angeles, mad hat tea party, mad tea party, novo fogo, sliders, tater tots, tea party, the minty, tots, zahra bates. Bookmark the permalink.